Friday 8th June 2018 – Attended the Magna Vitae Bowling Tournaments at the North Greens near the Suncastle where he helped present the trophies to the bowlers. Friday 8th June 2018 – The Deputy Mayor, Councillor Maggie Gray attended the Lisa Jay Stage Institite 10th Anniversary show at the Embassy Theatre. Wednesday 13th June 2018 – The Deputy Mayor, Councillor Maggie Gray was present at the Job Centre in Skegness for the launch of Universal Credit. Tuesday 19th June 2018 - Attended the opening night of Mr Fipps Wonder Circus. 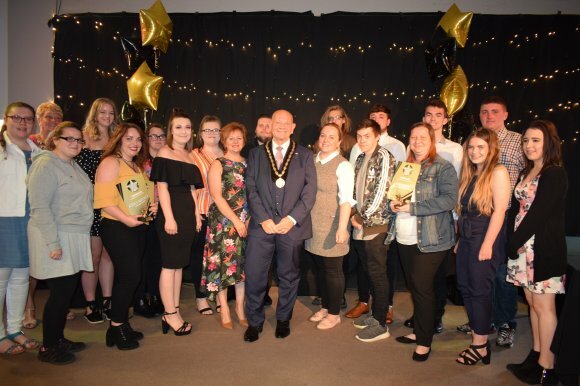 Thursday 21st June 2018 – Presented awards to students at the Skegness TEC Brilliance Awards held at the Storehouse. Saturday 23rd June 2018 – Both the Mayor and Deputy Mayor attended the CAP (Community Alcohol Partnership) Week opening event outside the Hildred's. Sunday 24th June 2018 – Welcomed the Bikers For Macmillan to Skegness after their Sunset to Sunrise ride across Britain. Sunday 24th June 2018 – Both the Mayor and Deputy Mayor were present at the CAP (Community Alcohol Partnership) out side the Hildred's in Skegness. Sunday 24th June 2018 – Attended the Phillip Grove BBQ to raise money for the Jo Cox memorial fund. Sunday 24th June 2018 – Presented the prizes to the winners at the Annual Mecanno Show held at the Embassy Theatre. 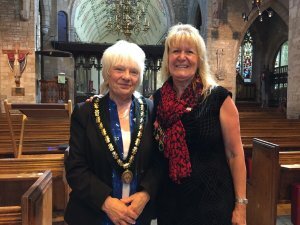 Tuesday 26th June 2018 – The Deputy Mayor, Councillor Maggie Gray attended the Armed Forces Day Parade in Spalding. Thursday 28th June 2018 – Watched the Skegness Playgoers performance of Cheshire Cats at the Neverland Theatre. It is their 80th anniversary. Saturday 30th June 2018 – Opened the Summer Fair at Skegness Junior School. Saturday 30th June 2018 – Attended the Skegness Health Campaign at the Royal Hotel.